I'm disappearing into the bushes for an indefinite period of time. I'm not really planning to come back out. I will no longer have internet access, so question and answer time is over. I plan to install the PRC 47 in the beginning of next month. I hope to read your posts again soon, if not then I hope you get back to transmitting. snail mail still good? "Now in Maxwell's theory there is the potential energy of the displacement produced in the dielectric parts by the electric force, and there is the kinetic or magnetic energy of the magnetic induction due to the magnetic force in all parts of the field, including the conducting parts. They are supposed to be set up by the current in the wire. We reverse this; the current in the wire is set up by the energy transmitted through the medium around it...."
I know it's been said before, but the impact of what that actually means wasn't very apparent until I saw it first hand. Does anyone know where to buy Eric's books so he gets paid the most?! He doesn't get royalties from his books. You can find all of Eric's material online at no charge. Just take a look at Lamare's Dollard collection. If you feel that he deserves money, you can donate to his paypal account. George Gaboury, San Fransisco Tesla Society operator, told me that his girlfriend has had an accident, and he has been her primary caregiver for the past few weeks. The 16 hours of Dollard footage has been put on hold until around August. Feel free to write the SFTS and let them know how interested you are in seeing Eric's work even if it is not edited since this is the primary hold-up. What's the address or email to contact him? I hope you'll take a moment to remember Philo T. Farnsworth when you turn on your TV or look at your computer screen. He made it possible, and if you ever meet another 14 year old as bright as Philo was, you'll be doing the whole world a great favor if you tell him about Philo and encourage the lad in any way you can. That quote is from the "Message From The President" link on the S.F.T.S. website. I am sure that some of you persuasive guys would love to remind George that Eric was adopted by the Farnsworth family for his accomplishments. George Gaboury, I am going to denounce you and your San Francisco Tesla Society if you do not release my material. I have been trying to get this material for 2 years. All you have to do is put it in an envelope and mail it. Just do it! Roy Stolti, you drove me out of my own station and will not respond to any phone calls about acquiring the Landers notebooks. This is BS. Since our mentor moved back into the wilderness it got very quiet on the forum. The good thing is all the distractions are also gone. I myself will keep working on Eric's assignment and I hope you builder types will do the same. I think Eric left us with enough information that we can succeed. Keep in touch, don't let this forum go to oblivion. Just finished this less than an hour ago. Do what you will to validate E.P. Dollard. You must have used a gallon of etchant but the finished product looks nice and professional. Which chemical are you using for etching? It is a 12"x12" board that I was able to etch with 1 quart of ferric chloride. It is not as professional as I had hoped. If you look closely, you can see the vertical seam on the left of where I had to join two transparencies with some clear tape. I would imagine that it will still work alright, but I will try something a bit different for making the second board. How do you find out the output impedance of an oscillator if it doesn't say it in the manual? Here is my personal donation to Eric P. Dollard. Here is a link to "Empire of the Air": Empire of the Air - America on DocuWatch - free streaming American history documentaries The sound doesn't quite seem to match the video, but this seems to be the only place to freely watch it on the internet. Does anybody have a copy of "Symmetrical Components" by Wagner that can get this material to Eric? Difficult getting people to understand that their Math is incorrect when it quite clearly doesn't match the original. This is in reference to Eric's Math for the Extra Coil which doesn't match the true Tesla Extra from the CS Notes. I have provided all of this data in previous Posts but it goes unattended. The amount of Copper in the Extra is more than double that of the Secondary where only 17 turns were used. I have proven this without doubt with my current Crystal Set. 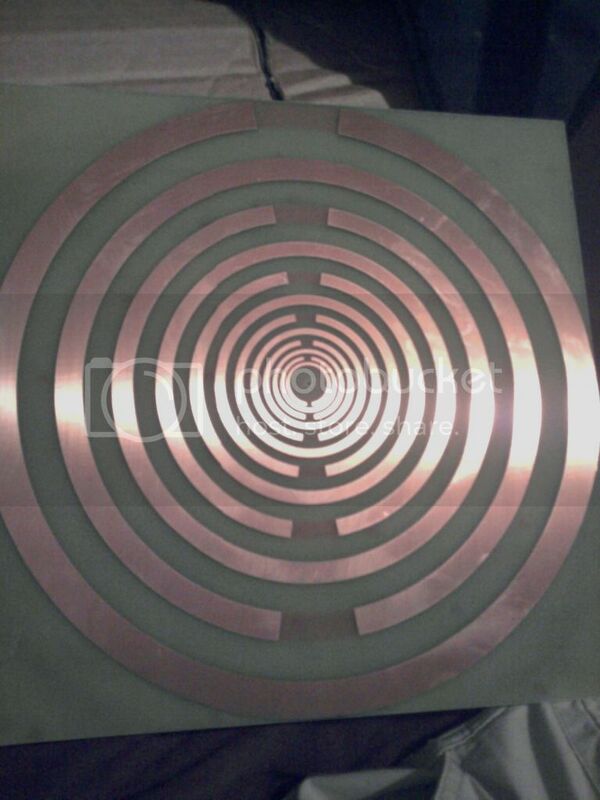 Going now to produce a new Extra that has a larger or longer form and wind it with wire that is closer to the 'true' TMT Secondary/Extra Copper mass relationship. The fact that the Extra is not a true scaled down version of the original in size is, I feel, not of importance but the LENGTH of wire is as it is nearly the same as the Secondary. Eric asked us to find all of this detail in the CSNotes and when presented as recorded, nothing happens. As a consequence I don't hear people jumping up and down with success stories and if they do receive a signal, it is from blanket overload from a powerful 50kW AM transmitter and not my measly 2 kW received via a ground current. Will advise when I have the new Coil up and running. Have been taking Eric's direction with focus on the work of Gerry Vassilatos and have uploaded an extract from his books at 'n6kph' which gives a good insight into his Telluric/Ground current experiments. There are 10 volumes that make up the entire Vril Compendium but have only been able to find several extracts but these may be all we need to gain an insight into this phenomena which has been clearly supressed or dismantled. It is clear to see that both Gerry and Eric worked well together during the Borderland Years. Presenting this to you in the hope that Eric can redefine the Math for his Extra Coil. I, too, have been quietly building, inspired by Eric. I have built a 2.5 foot diameter secondary coil, 20 turns (will adjust down to 17 to tune and compare) on a wooden frame. It's calculated with the equations given earlier, for 1 mhz. For the primary I used the exact same wire as secondary, measured the distance between two clamps and then clamped folded 10 turns of wire back on itself. I then cut the bundle at both ends and joined them together to make one primary turn (if I measured carefully enough). Two turns of 10 wires should match the mass of the secondary. That is a beautiful MWO antenna you have etched there. I have been making plans to build a similar one for a while now, since I saw the USPA MWO presentation. However being the perfectionist that I am, I have been attempting to teach myself how to draw the rings in log periodic form. Have still not finished that project yet. I don't think that Eric has been following your work on the N6KPH group. He never really looks there from what I understand. If you would take pictures of your setup and go step by step on your observations in one post on this thread, I know that he would respond. He wants to see PICTURES and DATA. I seen some place that copper antennas do oxidize and therefore should be plated. Into 750 ml water pour in 150 ml 35% concentration HCl with constant steering and before etching add 100 ml 30% concentration Hydrogen peroxide (H2O2). This method is definitely an outdoor procedure. Caution: Always pour the acid into the water and not the other way around and wear safety goggles and gloves during the procedure. I had the same problem but an INTERNET search gave me the answer for my unit. It appears from my search that now days most units will have the 50 Ohm impedance. ..... I have been making plans to build a similar one for a while now, since I saw the USPA MWO presentation. However being the perfectionist that I am, I have been attempting to teach myself how to draw the rings in log periodic form. Have still not finished that project yet. In the Lakhovsky Multiple Wave Oscillator Handbook, on page 79 are the dimensions given for the Golden Ratio MWO Antenna. I built a pair using plexy glass squares. I drilled a very small hole in the center for the compass point then I drew the circles on the plexy glass with black ink. Next I carefully applied glue with a small brush to the rings that will form the antenna. Do not apply glue all the way to the edges of the rings because the glue will then be pressed out to the areas that will be removed. Next I covered the square with aluminum foil and let it dry. The key to the success is to find a glue that does not harden to fast, allowing time to apply it to all the rings. I used rubber cement which sets up quite fast, but this was the best I could get here in Europe. Once the glue dries, take a compass with a very sharp blade and cut the circles and lift out the aluminum foil from between the glued antenna rings. The key here is using heavy duty aluminum foil and very sharp blade. X-ACTO makes them and they will fit into a special attachment for the compass. 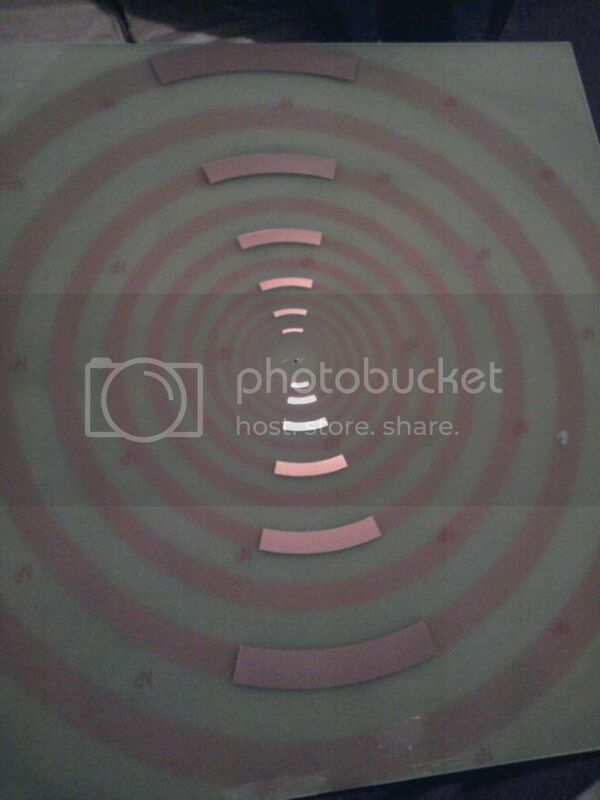 From the removed rings you can make the short cover pieces for the back side of the antenna. Are you making an MWO also? Thank you for posting your design. 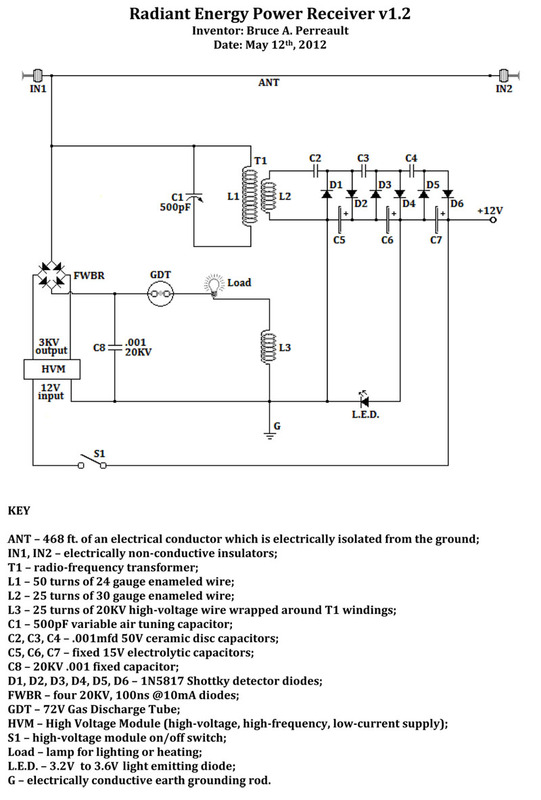 What are the values for C5, C6, and C7, also is C8 a .001 uF capacitor? I have the drawings done in AutoCAD 2009 if you're interested. Just shoot me a PM. Normally 400 ohms but goes up to 1,000 ohms as the frequency increases. Last edited by jpolakow; 06-09-2012 at 02:55 AM. Will get some data together with what works and what doesn't with pics but will probably wait until the new coil is built which should compliment the theory and CSNotes. We appear to be very limited here as to what we can display with reference to pdfs other than providing URLs which is not always possible and why I use the Yahoo 'n6kph' site for that singular purpose. I found Dollards description of a Tesla wave as being one of infinite amplitude and infintesimal wavelength very insightful. According to physics the energy carried in a wave is inversely proportional to it's wavelength. Given that a Tesla wave has no wavelength we put a zero in the equation. Taking a sinsoudial wave and time compressing it we get a Tesla wave. If the parent wave has energy of 1 then the wave modified will now have 1 times the amplitude which is infinity. No matter what you plug in as the energy of the first wave your answer is going to be infinity. So the Tesla wave is not really a wave. It looks more like what you would find in an electrostatic field or a description of a force. Now imagine an ocean wave which is 10foot from crest to peak and the gallons in a 10 section of wave 1000 gallons. The wavelength shortens to say 1 foot. The mass involved stays the same but the amplitude goes to 100 feet, The wave now can fill up a tanker 30 feet up and inland, whereas before it would have just dissipated rolling pepples up and down the beach. I am member of this forum since last summer. This is the "energetic forum" yet I have not seen one reference to or comment on T.H. Moray's experiment. He was Tesla's contemporary and thinking along much the same lines as Tesla. 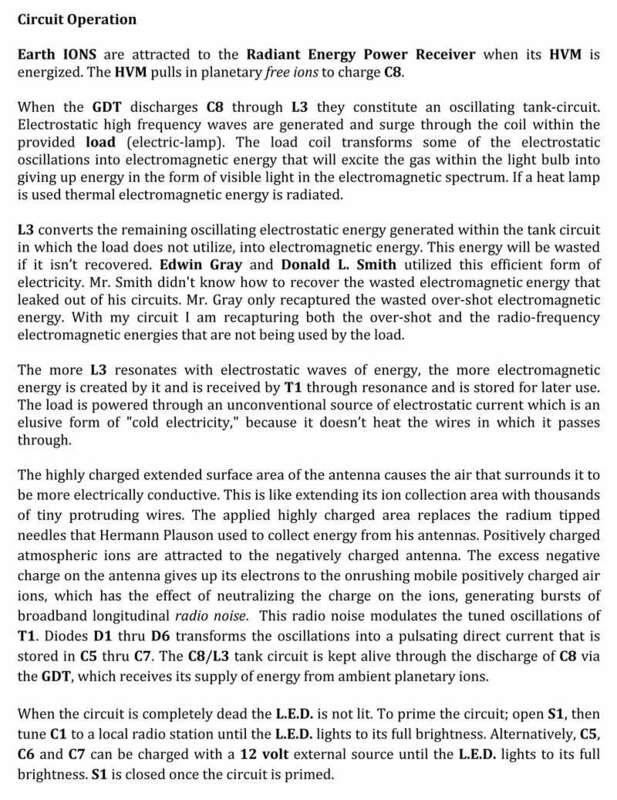 One of Dr. Moray's publication is called "Beyond the Light-Rays, Explanations of Oscillations of Radiant Energy". There is more information at rexresearch.com about Thomas Henry Moray's "The Sea of Energy". Any comments? Is this something we've done that made you do this, or your are just tired and need a break? I'd hate to have to start another "Peter, whatever happened to Eric P. Dollard?" thread 10 years from now to get your attention again. Saying that you won't have internet access means you won't be around internet cafes, libraries, or other free public terminals? Perhaps you could still come out of the bushes to at least drop us a note or two every once in a while? Please don't discard the entire humanity because of your past (bad) experiences with a considerably small number of people that interacted with you in a negative manner. Lastly, if I may humbly suggest, spend some time exploring one's self (within) as well, working to rid of that anger that's so prevalent in some of your posts. Honestly, it does not help you at all, and just drains life energy that you could focus elsewhere, on more productive things. Thank you for finding the will to get on the Internet and teach us some of your life's work.